When it comes to mice and keyboards gaming or otherwise there is one company everyone recognizes. 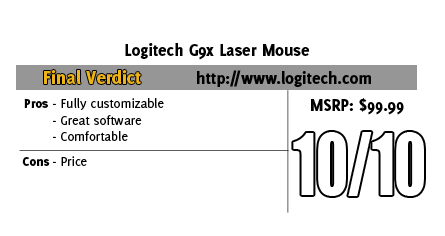 Logitech is by far the largest peripheral manufacture in the world. In fact December of last year they produced their Billionth mouse, that's a lot of mice! They have also made a name for themselves with the G series of gaming peripherals including the popular g15 and g5. Today I have the chance to take a look at the G9x, Logitech's most recently released gaming mouse. I should have high hopes considering its family, but I can't help to be a little unsure. I was a big fan of the g5's shape and the G9x doesn't resemble the g5 at all, so who knows. Packaging If you have seen a Logitech G series mouse before the G9x's packaging will look very familiar. Obviously this is a case of why change a good thing, their package design showcases the G9x while giving you the chance to feel the shape of the mouse without opening the packaging. Where the g9x's packaging differs from the older G5 is the G9x package opens up. Inside the 2nd included snap on grip is showcases. Along side of the grip Logitech included pictures of the G9x along with pointing out all of its features. On the back you will find more pictures along with more in-depth information on each of the main features. They also included a specification listing tucked away on one of the sides in case you are looking for it. Comfort So I was really concerned moving to the G9x having been a big fan of the shape of the g5/g7 in the past. Logitech did something different with the G9/G9x by giving them the ability to change grips. What that means is if you're not comfortable with one you can change it up until you find something you like. Being a big guy, naturally I went straight for the "wide load" grip. I found the wide grip to be very comfortable, it even has a small wing under your thumb to keep it from rubbing on the mouse pad. The other included grip is called the precision, I found this also to be comfortable. It was a little smaller than I would like but did have a similar shape to the Sidewinder x8 that I am a big fan of. Both of the grips give you full access to all of the mouse buttons including the thumb buttons. Another thing to note would be the precision grip has a rougher texture than the wide load, both are comfortable, this gives you one more way to tune the G9x to your needs. Software Running Windows 7 on my main rig I had to do a little digging to find the most up to date software for the OS. For anyone else you can use the included disc or Logitech's website. With everything installed and running I dug around their Setpoint software to see what all can be adjusted. I was surprised to find out that ANYTHING you can imagine can be adjusted including the LED colors. Each button can be set to any function including fully programmable macro's. You have full control of your pointer including separate X and Y axis control for each of the adjustment levels (up to 5, this is also adjustable). With a maximum of 5000 DPI i doubt that anyone will be looking for any more sensitivity. If that wasn't enough Logitech also gives yo the ability to set the Vertical and Horizontal scrolling speed. Once you have your buttons setup you have the option of letting the software switch your profiles depending on the application you are running or you can switch between profiles stored in the onboard memory using a button on the bottom of the mouse. The later also means that once you set everything to your liking you can use it on any PC without installing the setpoint software, perfect for professional gamers or someone who games on both a home pc and a laptop. Performance The G9x is a gaming mouse, so of course I had to test it out at a LAN. I took the G9x to our friends Muncie Gamers event. The G9x glided over the Razer Destructor mouse pad smoothly due to the large Polytetrafluoroethylene feet, try saying that one three times! Going along with the fully tunable theme you also have the ability to change the weight of the G9x with up to 28 grams of metal weights that come in a nice storage tin. In game the tracking was perfect and when i needed to slow the DPI down for sniper shots it was as simple as tapping the minus key. Out of game there was one feature that really stood out to me. The g9x's scroll wheel should be cloned and put into every other mouse. It is made of metal with a rubber grip down the middle. The scroll wheel also has side scrolling capability and my favorite, the ability to turn the clicking on and off. With the press of a button on the bottom of the mouse you can turn off "microgear" mode (the clicking when you scroll). With microgear turned off a short flick will let the scroll wheel spin until you stop it, moving you to the bottom of a long document or website in no time. Overall Even though when I heard about the G9x I was a little skeptical about it, I was pleasantly surprised with a mouse that gives you the ability to change/adjust/tweak/tune every single aspect of it. No other mouse has the ability to change its shape, turn the scroll wheel clicking on and off, program every button, and even change the LED colors all together on one mouse. With the G9x you also one of their designs or even one of your own to really make it one of a kind! I like the direction Logitech went with this one, I would really like to see a few more options for grips just to fine tune everything. Most of the mice let you customize them, but Logitech really set the bar on this one. I have this mouse! It is pretty much awesome! Your review pretty much sums it up. It definitely took a few weeks to get used to, switching from a MX518. I didn't even know that you could change the colors.....and I've had this mouse for like a year now???!?!??!? Thanks guys for the feedback, it means a lot! Its funny because I was thinking about bringing this mouse back into rotation as I was setting things back up after the lan. I'm going to try going back to the Microsoft Sidewinder X8 right now though.